DIVINE. Relating to God, gods or goddesses: connected with, coming from or caused by God or a god or a goddess. So when one of my BFF’s chose this word to describe these cupcakes I was more than a little flattered. I mean…I’ve never been called a goddess before! (Well, at least not by anyone other than the voices in my head.) What we have here are Hot Chocolate Cupcakes with Candy Cane Kisses and White Chocolate Peppermint Buttercream. I found inspiration for these cupcakes over at Half Baked. I wanted to include peppermint in a way that did not include making my own peppermint bark (good lord, who has the time for that?) and ended up over at Picky Palate where she used Hershey’s Mint Truffle kisses to add a sweet surprise inside. Then I found a great White Chocolate Peppermint Buttercream over at Becky’s Cakes. Becky’s buttercream turned out wonderfully. I believe I ended up using 2 tsp. peppermint extract, as well as just a bit more than the 3-4 Tbs. heavy cream asked for. All butter buttercream has always been a favorite of mine. “Everything’ better with butter!” If you’ve not tried all butter buttercream then you’re in for a treat. It’s not as sweet or “heavy” as shortening based buttercream, but it’s also more delicate. The heat of your hands when working with it can soften it enough that you have to put it in the fridge to let it set a bit before using again. I tried a couple different decorating techniques with these before ending up with the 2-tone swirl above. 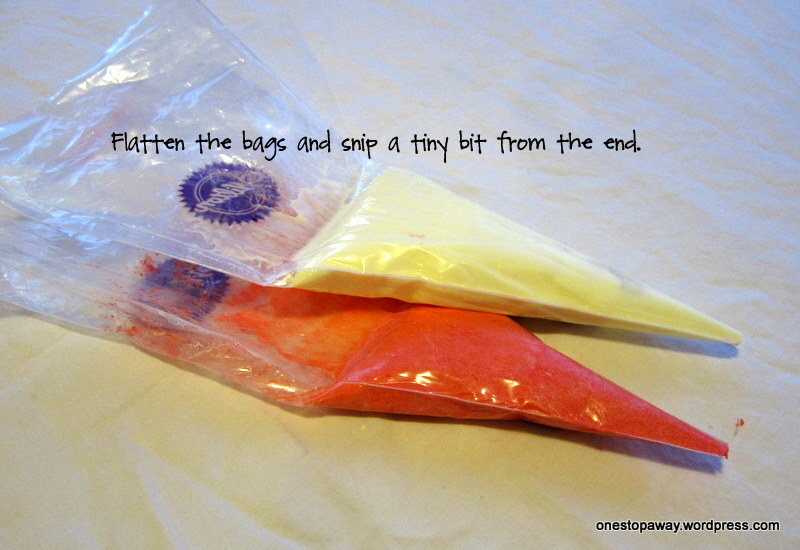 Becky had striped her icing bag with red food coloring and then piped it on. I tried that, but yeah….didn’t like that. 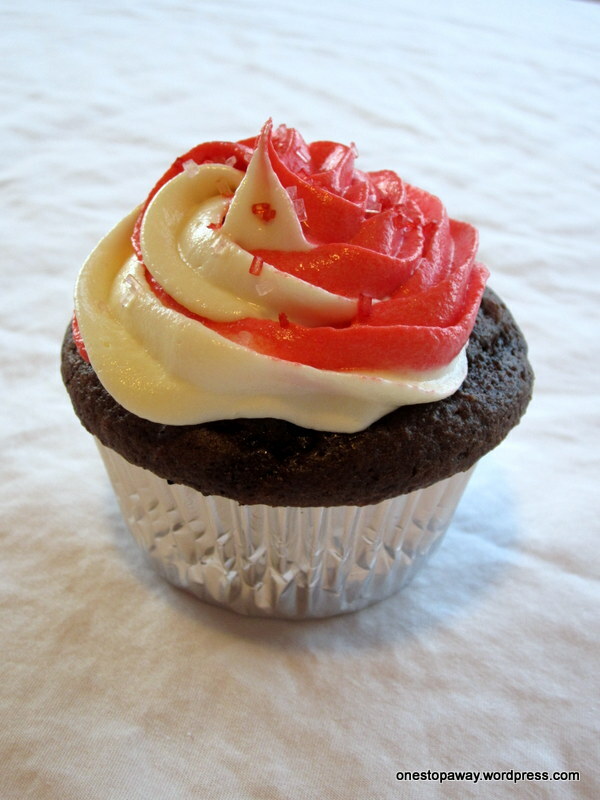 I tried putting 2 colors of icing (white & red) in one icing bag and piped, but hmmm….still not quite there yet. 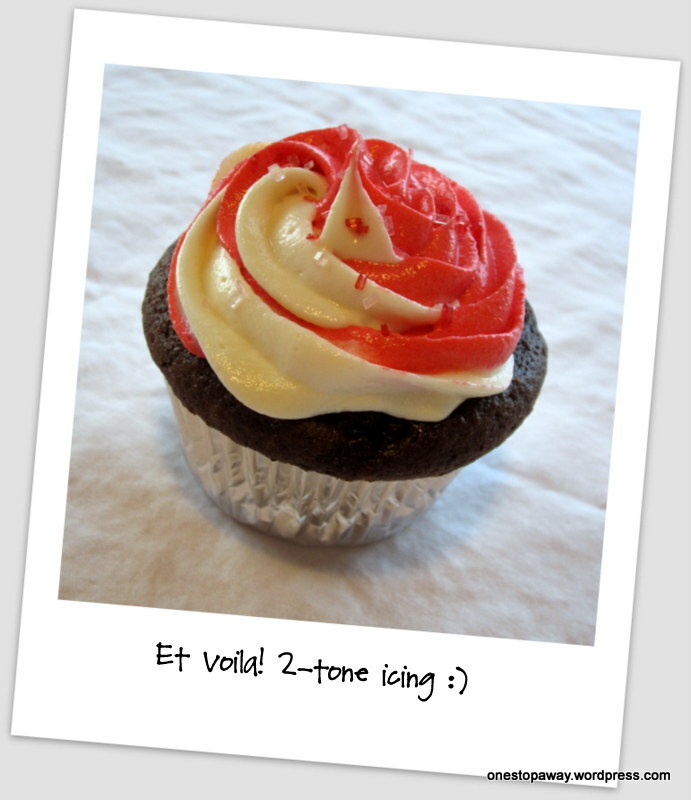 I ended up sticking with the easiest way I know to do 2-tone icing. These were first intended as after school snacks for The Middle Child’s Daisy troop; however due to a snow day that was cancelled. Then I thought, “Perfect! New Year’s teacher gifts!” You know…because I was too lazybusy to get it done in time for Christmas. BUT I just couldn’t resist slicing into one of these to show you.